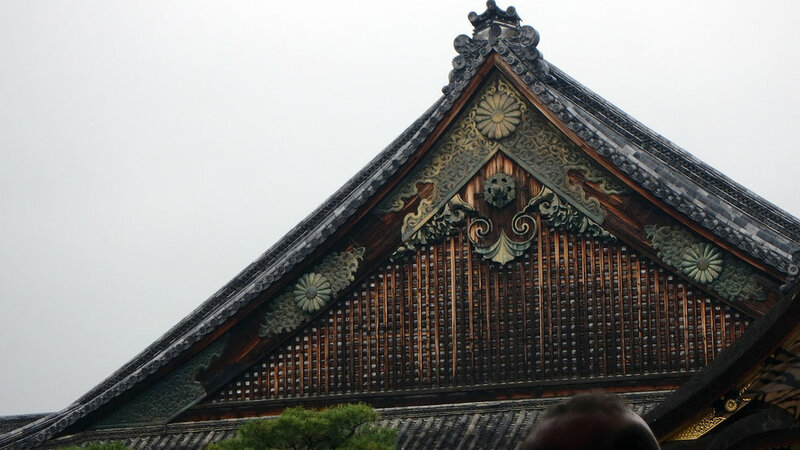 Nijo Castle is a flatland castle in Kyoto. The photos you see here are the outside of the castle, as photos are not allowed inside of the castle. We took off our shoes and walked through Ninomaru Palace to see the many reception chambers, offices, and living quarters of the shogun. Bonnie's favorite part of the palace is the "nightingale floors," which were constructed in such a a way as to squeak like birds when anyone walks on them, to protect the occupants from sneak attacks and assassins. Bonnie says, "it's unimaginable how all of this was constructed! I loved the whole idea of walking along and hearing birds singing!" Nicole loved the interior paintings on screens: especially the ones that humored the shogun's love of falcons. It was really cool that they staged the interior rooms with statues of feudal lords kneeling as if they are meeting with the shogun.